The Earl of Shrewsbury asked Her Majesty’s Government what measures they are taking to improve flood defences in agricultural areas. My Lords, the noble Lord will be only too aware of the huge contribution that British agriculture makes to food security. Could he therefore tell us what assessment Her Majesty’s Government have made concerning the risk to food security due to poorly planned flooding amelioration and prevention schemes, which are allowing considerable areas of high-grade agricultural land to be taken out of production due to flooding? I am grateful to the right reverend Prelate for coming to see me the other day to talk about these things. There is currently no evidence that flood events such as those experienced in 2007, 2009 or 2012—or, so far, in recent events—represent a threat to food security in the United Kingdom. According to the UK food security assessment, the UK enjoys a high level of food security as a developed, stable economy. I think it is more likely that disruption to transport links could impact access to food supplies, but we are watching this carefully. The Bishop of St Albans spoke during Lord Singh of Wimbledon’s debate on relations with the Sikh community following the publication of government documents regarding British involvement in planning the attack on the Golden Temple. He focussed his remarks on the positive role that the Sikh community has played and continues to play in British society. He welcomed the lack of violent or radical response from the community in light of the publication of the documents, but warned of the danger that it could happen. He called for a wider inquiry into the broader relations between the UK and Indian governments at the time. Baroness Stedman-Scott asked Her Majesty’s Government what steps they are taking to equip young people with the skills necessary to enter the job market. 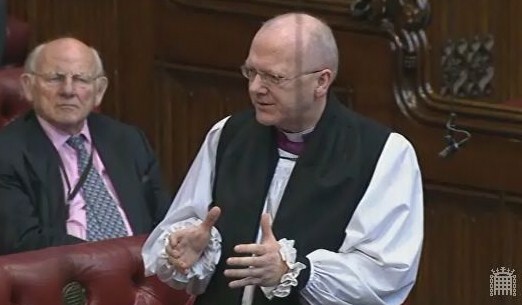 The Lord Bishop of St Albans: My Lords, there are four times as many 18 to 24 year-olds looking for work at the moment as there are in the 16 to 17 age group. Yet the Government’s policy on apprenticeships for 19 to 24 year-olds is to ask employers to pay half the costs of the learning framework. Many businesses, especially SMEs, will pause before taking on an apprentice because of this. Does the Minister agree that if this requirement were to be removed, it would hugely encourage many more young people to get into apprenticeships as well as giving them much more of a chance to succeed? Lord Ahmad of Wimbledon: The right reverend Prelate makes an important point, but I am sure many noble Lords are aware that the Government do support local businesses. Indeed, they have made additional funding available to small businesses that are looking to take on both trainees and apprentices. On the age group that the right reverend Prelate mentioned, particularly 19 to 24 year-olds, in October 2013 the Government announced funding of an additional £20 million to support the expansion of traineeships, which are helping even more young people to get the skills and experience they need to get into full-time work.